"Who would've thunk that so few ingredients would make the best, and I mean BEST, mushrooms that you've ever tasted? I always serve this at Christmas. 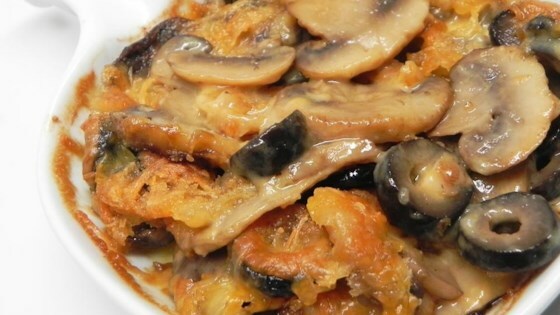 Use any combination of mushrooms you like, but make sure to use fresh and not canned." This was not even close to a good recipe. It tasted like olives and cheese. It more like a pizza topping. very good .. goes great w/ any meal and so easy to prepare! I loved it. I liked them mushrooms more than the olives so next time I will 1/2 the olives. I used the mushroom juice over the top instead of butter and it seemed to work fine. This was very easy to prepare, smelled wonderful while cooking! I used some of the juices from sauteeing instead of butter on top. It was a big hit with everyone!.